American Sycamore - Platanus occidentalis L.
Photos by Lesley Bruce SmithThe Sycamore or Planetree is among one of the most commonly planted street trees in the world, so I thought that after all the press that trees damaged by Sandy have received it would be good to feature a common East Coast street tree. Sycamore is distinctive because of it’s big leathery maple-like leaves and it’s remarkable patchy white grey bark. In our Chicago area, it suffers a good deal from a fungal disease known as anthracnose which causes it’s leaves to drop off early in the summer making it look pretty raggy. It also suffers from air pollution so that can make it look unattractive, as well, by creating sticky stubby growth at the ends of branches. It is a beautiful tree in the right location, however, as all trees planted in the right place can be a beauty to behold. 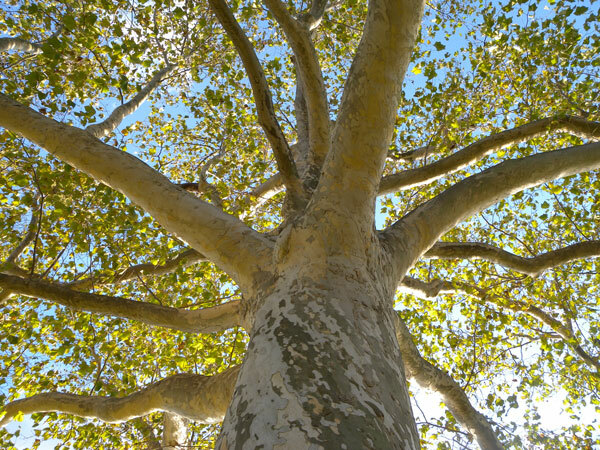 We tend to see more healthy specimens of Sycamore in the Eastern half of our country and they can tolerate sporadically wet soils, as in their native settings they prefer river bottom land. Every month we try to share some of the ethnobotany of the species we are featuring. “Ethnobotany, what in the world is that?” Glad you asked...it is the scientific study of the customs and culture of a people group and their relationship with and to plants. We always find these facts interesting and informative and we hope you do too. 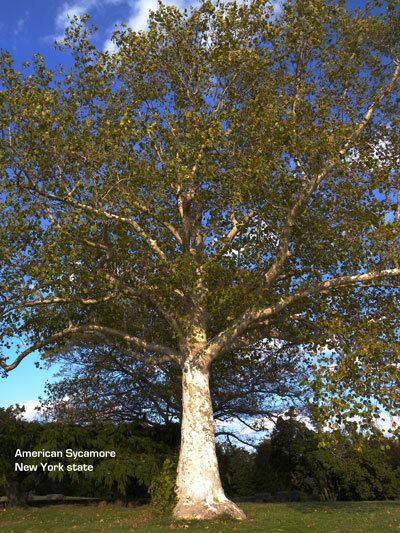 First peoples in America used the Sycamore for a variety of medicinal purposes which included cold and cough and respiratory remedies, gastrointestinal aids, dermatological and even gynecological remedies. It is sad to realize that the use of native American trees to create medicinal remedies have been all but lost to us due to the use of pesticides world wide, which has effectively damaged the trees. There has also been a loss of knowledge from one generation to the next on how to create these remedies. In spite of this, it should also be noted that today most of the medicines sold in our pharmacies come from plant based derivatives. Another testimony to how trees and plants heal us. Scotts Pine; Lesley Bruce SmithAcross the street from my favorite Cafe, a tree is gone. 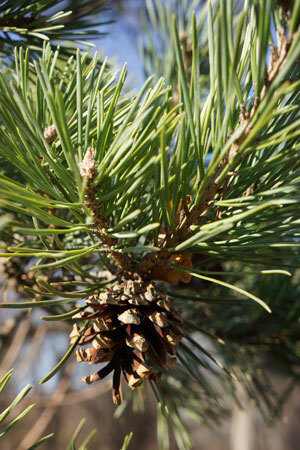 It is like a missing tooth to all those who enjoyed her orange flaky bark and sweet Pine scented needles. A 70 year old Scotts Pine, she was one of the older residents of Vernon Hills, planted well before the malls sprung up around her. She might have been part of the government tree planting in response to the dust bowl days of the 1940’s. It makes me sad, I could have saved that tree. This senior citizen didn’t get enough water, and the grass underneath her branches displaced and out competed her roots so she couldn’t even absorb the water when it was plentiful. Because of drought stress she lost resistance to a bark boring insect, Ipse Beetle. I tell this story because the drought this summer - the worst drought since the drought that caused the Great Chicago Fire in 1871, will be killing many more of our lovely old trees. In fact we will be feeling the effects of the drought of 2012 well into 2015 and beyond. Many of our clients heeded the warnings and watered and mulched their trees. While inspecting them this fall I’ve been so impressed with how much effort many have given (along with high water bills) and how effective this has been in saving their trees. It may have been difficult hauling and setting hoses but you are now part of a legacy of living trees for generations. It warms my tree loving heart. The super storm/hurricane Sandy certainly has grabbed our attention! Many of the images we have seen are confirmation of the truth that most of the damage to trees is preventable. Every time we have a big storm that takes trees down or does significant damage to them, we are reminded of how many failures could be prevented if we were to understand just a little about tree physiology and respect it. We have even heard reports that the way to avoid all the power outages is to “cut down all the trees”. Even though this reasoning seems ludicrous, we need to address it seriously. These kind of statements show a complete ignorance of how trees grow and the good they do. That good includes but is not limited to increased mental and physical wellbeing, pollution mitigation, water preservation, limitation of soil erosion, carbon sinking, increased air and water purification, oxygen production, carbon dioxide absorption, shade producers which reduce energy costs lowering needs for air conditioning and wind breaks reducing heating costs, wildlife habitat, and numerous studies including the landmark study at the University of Illinois that proves that by just seeing trees we heal faster, are less agitated and aggressive and our kids have lower rates of ADD and asthma. Every day that Arborsmith’s staff goes out to work we are limiting and reducing the bad effects of catastrophic storm damage on trees. Many of our clients escape massive storm damage because they have used their resources to protect their trees and themselves from the effects of high winds. When we get massive storms like Sandy that dumps over 6 inches of rain and then sends 150 mile an hour winds there is going to be catastrophic failure. However, so many failures could be eliminated simply by knowing what to look for and/or recognizing a tree’s growing requirements and respecting those. 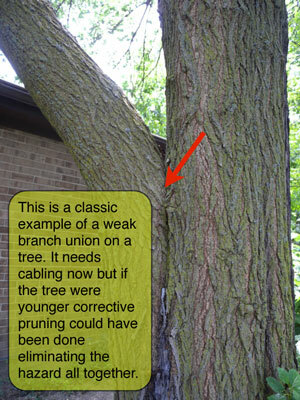 Storm damage mitigation can be as simple as annual check-ups by a certified arborist professional.